This entry was posted in Uncategorized and tagged fineartfriday, learning by alivingpencil. Bookmark the permalink. Ah then my friend there is the Rijksmuseum in Amsterdam, with it’s Vermeer blues and the spectacular larger than life Night Watch, not to mention a Rembrandt thrown in here and there. Loved this post. treasure you. @roseteacup – See? I needed you to tell me! (she adds Amsterdam to her list.) Actually, my maternal grandma spent her first ten years in the Netherlands. I have reasons to go there, too. I treasure you too! And my maternal grandmother was in Broek op Langendijk about the same time. fun that. 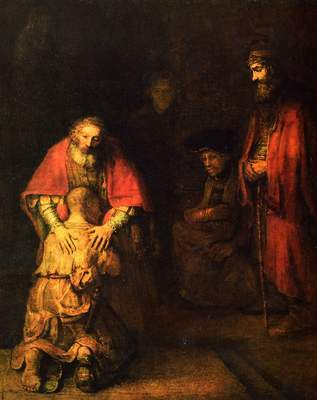 In Henri Nouwen’s book “The Return of the Prodigal” he tells the story of getting special permission to sit and look at Rembrandt’s painting for a day. 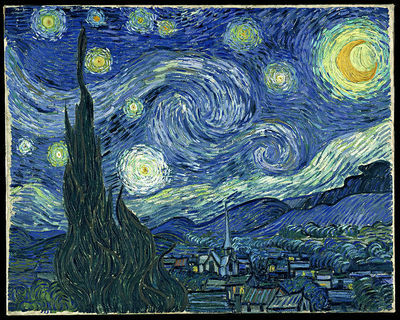 His insights on the painting and the story it tells are wonderful. @jackug – Thank you! I will have to look that up. You are always ready with a wonderful link! Vivoli’s gelato stand in Florence is probably the high point of European culture, after that St. Pete. @Karen Glass@facebook – Karen, it was amazingly ridiculous of me to have omitted Krakow from my original list. I’ve wanted to go to Krakow ever since I read The Trumpeter of Krakow. And I can tell you that I’ve read a boatload of Holocaust memoirs. I must look up DaVinci’s Lady with an Ermine. Here’s what I wrote in 2007 about a friend’s visit to our house:Lingering around the table, Mark told us about his recent trip to Poland, his three week course in Polish and the idiosyncrasies of that language. His mom lives four blocks from Schindler’s factory in Krakow. Mark said that you could see bullet holes in the walls around the holding area where they rounded up the Jews.Mark gave us several recommendations of foreign films to watch. We’re ready to check out Robert Bresson’s filmsand particularly eager to watch Dekalog, one hour filmsinspired by each of the ten commandments.Have you heard of the Polish poet Czeslaw Milosz?God has been surprising me a lot lately, along the lines of “exceedingly above all you could ask or think.” So don’t you be surprised if I show up on your doorstep one day! Thanks for the comment, Karen. The Hermitage was …. gloriously strange. A roomful of Monets — not temperature controlled, open windows, humidity dripping down the walls… The Prodigal was…. spectacular. Haunting. My favorite. St. Petersburg was, by far, my favorite part of our summer in Minsk [we took two train trips – one to St. Petersburg, one to Moscow. I was far more smitten with St. P.] I will go back someday. I was so focused on Anastasia and the Romanovs that I missed much of the other parts of the gorgeous town.